Sports betting should need no introduction. If you're interested enough to have clicked here, then you've probably been making recreational bets on sports with your friends since the age of 12. However, in Vegas, sports betting is big business, with lots of bets to choose from and terminology that goes along with them. What I hope to do here is explain how to read the board and make a wager as well as offer some advice on what to bet on. My apologies in advance if you bet sports, but don't bet football. Football is the king of sports when it comes to sports betting, so that is what I focus on below. The same rules and advice more or less apply to all sports. Look at the left side of the board, under the column heading "N.F.L week #5." The left column lists the bet numbers. These are used for purposes of identifying what team you want to bet on and makes betting at the window go faster. For example, a bet on the Vikings is number 401. The second column to the right lists the team names. The third column shows both the point spread and total, which I’ll explain later. The fourth column reports the money lines, which I’ll also explain later. 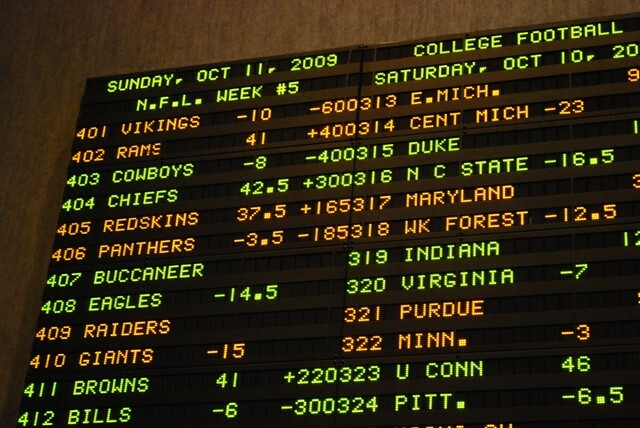 Let's take a look at the following picture I discretely took of a betting board before the NFL week 5 games. As an example, look at the Vikings Vs. Rams game in the upper left corner. Going into week 5, the Rams were just horrible, so the market strongly favored the Vikings to win. In an effort to balance the bets on both sides, the Rams were given a 10-point handicap. The 10 is called the point spread. It is usually preceded by a minus symbol by the favored team. A way to think of it is that 10 points will be subtracted from the Vikings score, for purposes of bets against the point spread. When betting against the point spread, usually for every $11 you bet, you'll win $10 plus your original wager, if your bet wins. So, to keep wins in nice round numbers, bets should be evenly divisible by 11. So, if you bet $55 on the Vikings, you will be given a ticket that says what you bet on, and that if the bet wins, it will pay $105 ($50 win plus the original $55 wager returned). Such a bet on the Vikings will win if the Vikings win the game by more than 10 points. A bet on the Rams will win if the Rams win outright or if the Vikings win by less than 10 points. If the Vikings win by exactly 10, then bets on both sides will push, and the tickets can be redeemed for a refund. In my example the refund would be $55. The actual score of that game was Vikings 38, Rams 10, so the Vikings not only won the game, but easily beat the spread, too. Assuming you bet randomly, and ignoring ties, betting 11 to win 10 results in a house edge of 1/21, or 4.76%. Sometimes casinos will have happy hours, during which time you only have to "lay 105," which means risk $10.50 to win $10. Under the same assumptions, that lowers the house edge to 1/42, or 2.38%. My advice for betting against the spread is simple: BET ON UNDERDOGS. Across all NFL games from 1983 to 2008, excluding "pick" games with no favorite, underdogs covered the point spread 51.47% of resolved bets. Favorites won only 48.53%. Laying 11 to win 10 the loss on underdogs was only 1.69%, while on the favorites it was 7.15%. I don't think this is a statistical aberration in favor of underdogs. It is common knowledge in the industry that recreational bettors tend to favor betting on favorites. Generally, bettors tend to bet on teams they like, and the better teams tend to have more fans. This creates an imbalance of demand on the better teams. This results in the market discounting the underdogs, in an effort to balance the action. This advice is most applicable to the NFL, but holds true for any sport. This underdog phenomena has not been as strong since 2003, so take my advice with caution. To make a bet against the spread is easy. Just say the bet number and the amount you want to bet. It will be implied that you wish to bet against the spread. For example, if you want to bet $110 on the Rams, you would say "Number 402 for $110." Another common bet is on the total number of points in the game. In the Vikings vs. Rams example, the total points were projected to be 41. This is not surprising, as that is just about the average number of points per game over all NFL games. A bet on the total is simply whether the total number of points will be over or under 41. Like point spread bets, the bettor must risk $11 for every $10 in winnings. In this case, if the total is exactly 41, then bets on both sides will be refunded. My advice for betting totals is simple: BET ON UNDERS. Over every NFL game from 1983 to 2008, the unders won 50.77% and overs won 49.23%, of resolved bets. Laying 110, the loss on unders was 2.98%, and on overs was 5.88%. This is not surprising, as recreational bettors like to bet on things to happen. They like to cheer when a touchdown is scored. This creates value the other way, as the sports books adjust their total lines higher to induce bets the other way, balancing their action. To make a total bet, say the bet number of either team in the game, "over" or "under," and the amount of the bet. For example, if you wanted to bet $22 that the Vikings Vs. Rams game would go under 41 points then say, "401, under, for $22." Money line bets are on who will win, straight up. In the case of the Vikings Vs. Rams game, the Vikings are big favorites to win, so if you bet on them, you don't win much. To be specific, the -600 on the Vikings means for every $600 bet, you will only win $100, if the Vikings win the game. Remember, you would get your original bet back too, so a $600 ticket on the Vikings would get back $700. The money line on the Rams is +400, which means a $100 bet would win $400, for a total of $500 back, if the Rams win the game. As always, you don't need to bet these exact amounts; any wager (subject to sports book limits) will pay according to these ratios. I don't know how this notation for money lines got started. As far as I know, the United States is the only country that does it this way, while the rest of the world is on a decimal notation that simply shows what a $1 bet will get back if it wins. In my opinion, the decimal notation makes more sense. My advice on money lines is the same as that for point spread: bet the underdogs. Remember that underdogs usually don't win straight up, so the volatility is greater betting them against the money line. To make a money line bet, you would say something like "401 money line for $100." A parlay bet is on one or more event, and all must win or tie for the wager to win. There are two ways to bet parlays, either off of a parlay card or "off the board." For the recreational bettor, I recommend betting off the board. If you entirely pick against the point spread or total, laying 110 to 100, then the sports book will force you to certain stingy payoffs. My advice is to mix in at least one money line wager. To make a parlay bet off the board, go to the window and say "parlay," and then the things you want to bet on. For example, you might say "Parlay 402, 403 under, and 405 money line." Again, if you don't specify a type of bet, it will be assumed you mean against the spread. If you win, you'll get paid as if you made each bet individually, letting the money ride each time. In this case an $10 bet would get back $10×(21/11)×(21/11)×2.65 = $96.58 if it won. Teasers are like parlay bets, except you may only bet against the spread and total, and you get 6 to 7 free points on each pick. However, nothing comes without a price, and the wins are significantly reduced because you get the free points. The following table shows what MGM-Mirage casinos pay on NFL teasers. For recreational bettors, my advice on teasers is simple: DON’T BET THEM. The following table shows the house edge based on every game and side from the 1983 to 2008 seasons and the MGM-Mirage wins. For teasing totals, it gets even worse, as the following table shows. If you remember just two words from this page, they should be UNDERDOGS and UNDERS. For more information on sports betting, please see my companion site WizardOfOdds.com. "ANY" value in testing betting systems? "Secondary" market for sports bet?